Dieting doesn't work-eating right does! Low-starch, alkaline foods speed weight loss. Toronto, Canada, and Virginia Beach, VA, August 19, 2008 - The reason many weight-loss diets fail is simple: they end up starving an already malnourished body. Whether we are seriously overweight or just in need of shedding a few extra pounds, the excess weight we carry is in direct proportion to the amount of nutrients that have not been supplied to the body or have not been assimilated. 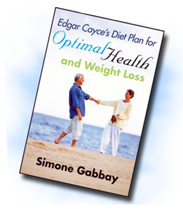 "Simply eating less is not the answer," says Simone Gabbay, a Toronto-based nutritionist and the author of Edgar Cayce's Diet Plan for Optimal Health and Weight Loss, a ground-breaking weight-loss book based on the dietary recommendations of renowned Virginia Beach visionary Edgar Cayce. "Severely restricting food intake further deprives the body of nutrients. What is needed is an emphasis on quality, not just quantity, of food. Weight loss is a question of eating more of the right foods, and far less-ideally none-of the wrong foods." Did you know that your body can burn fat even while at rest and that certain foods and food combinations enhance this natural process? The low-starch, alkaline components of the Cayce diet synergistically support the body's fat-burning potential and help to balance the endocrine system, which plays a key role in weight management. Centered around natural whole foods and alkaline-forming vegetables and fruits, the Cayce diet optimizes all metabolic processes and thereby helps build a leaner, healthier body. Visit http://www.edgarcaycediet.com . Simone Gabbay, RNC, is a holistic nutritionist in Toronto, Canada, who has studied and worked with the Cayce material for more than 30 years. She is the author of two previous books on diet and health, both published by A.R.E. Press. She writes two regular magazine columns and is a frequent contributor to major Canadian health publications. Visit her website at http://www.simonegabbay.com. The contents of this Web site, and those of the book it promotes, are for educational and informative use only. For the diagnosis and treatment of any disease, please consult a physician or qualified health care provider.